It's the 8th time the "ideas festival" has been held in Exeter. It takes place on Friday 5th April, at the Exeter Northcott Theatre. Tickets for the live event and a livestream at the University of Exeter’s Alumni Auditorium sold out in 10 minutes when they went on sale in November. “Every year people around the world watch live online as our speakers take to the stage right here in Exeter. 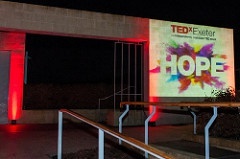 Anyone who has been part of TEDxExeter over the past seven years will know what to expect, but if you’re curious about the world around you and want to be challenged, moved and inspired, why not pop along to a livestream event or host your own?"